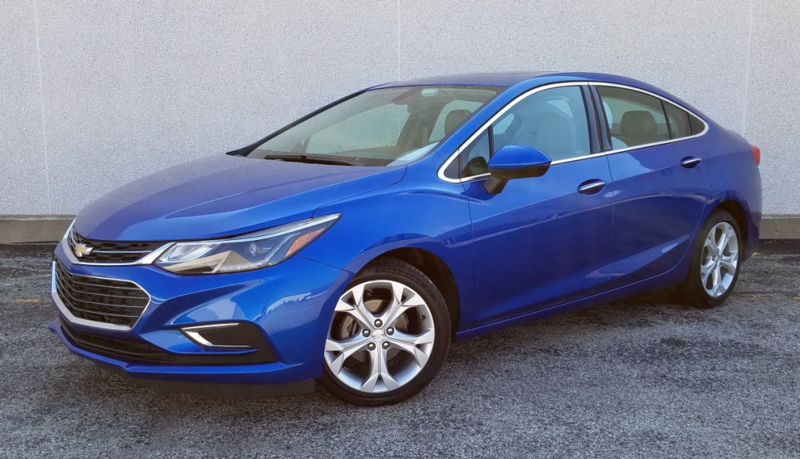 The fully new Chevrolet Cruze compact sedan—two adjectives are necessary because the previous-generation Cruze remains on sale as a 2016 model—is a little larger, a little lighter, and a little more powerful than its predecessor. Taken as a whole, it’s more than a little better than the first-series Cruze. Though larger (and lighter) than the model it replaces, the new Cruze is not dramatic departure from the 2015 model stylewise. 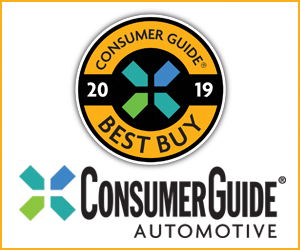 Consumer Guide® got the chance to test a Premier model, the new name for the top-of-the-line Cruze formerly known as the LTZ. 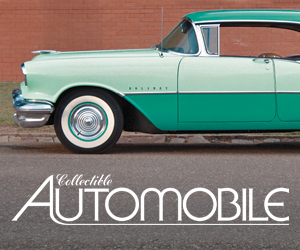 It comes in competitively priced at $23,120 before delivery fee and options are added. That buys a turbocharged 1.4-liter four-cylinder engine and six-speed automatic transmission. The exterior sports bright-accented door handles, a bright molding around the side windows, heated mirrors with body-color shells and integral turn-signal flashers, and 17-inch alloy wheels. Passengers settle into leather-covered seats (heated in front), and drivers grip a leather-wrapped steering wheel on a tilt and telescoping column. Comfort and technology standards include air conditioning, a USB port and auxiliary jack, six-speaker audio system, remote and keyless starting, Chevrolet MyLink touchscreen infotainment system with Bluetooth streaming and Apple CarPlay and Android Auto capability, satellite radio, OnStar services remote app, and 4G LTE Wi-Fi. There’s no need to stop there, however, and CG’s test car didn’t. It came to $27,250 delivered thanks to extra-cost paint and a pair of option packages that added a power sunroof, navigation, nine-speaker audio, automatic air conditioning, wireless cell-phone charging, heated rear seats, and more. The Cruze cabin presents well, and is nicely finished for the class. Front-row accommodations are generous, but second-row seating can be tight behind taller front-row occupants. Built this way, the Cruze is an utterly modern and useful small sedan, though not overly plush. “Soft paint” on the tops of the dashboard and doors impart a slightly satiny surface feel but press them and you’ll find there’s no padding underneath. Truly soft surfaces are found only on the door armrests, the dash above the glovebox, and the armrest-lid to the console cubby. There’s a little bit of bright trim here and there—on the steering wheel, around vents, etc.—and the test car came with a brownish two-tone “Atmosphere” interior that added a modicum of visual interest. (Black is the only other interior color for the Premier.) Increasingly common safety technologies like forward-collision alert, lane-departure warning and lane-keeping assist, and rear cross-traffic alert are available in a $790 option group. New for the 2016 Cruze is wireless cell-phone charging. 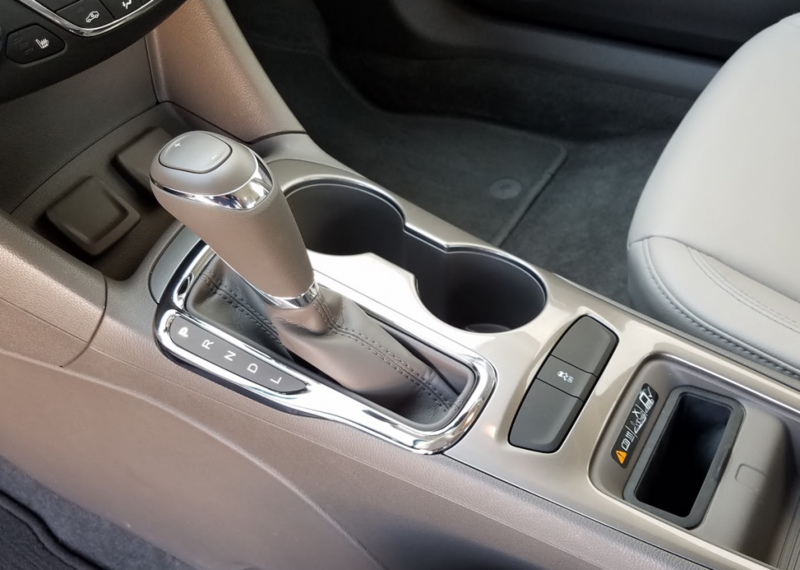 The charging “dock” is located at the base of the center console. New styling inside and out is in keeping with themes established for other Chevy sedans. This is particularly true of the instrument panel, where twin large analog gauges for the speedometer and tachometer are found at either end of a legible vehicle-information screen. Small fuel and temperature gauges are walled off in an area above the main dials, and are harder to read at a glance. Tuning and volume knobs are the only external controls for the audio system; everything else is regulated—easily and intuitively—on the MyLink touchscreen. For climate control, rotary knobs quickly dial in desired temperature and fan speed, with well-marked individual pushbuttons for other functions. The more aerodynamically attuned exterior does make itself felt inside in one way: Vision to the rear corners suffers a bit as a rising beltline meets a rapidly sinking roofline to block the view. Seats are comfortable with good support front and rear. Front passengers can stake out a lot of legroom, but if they do, they’ll make things tight for rear passengers. If this 5’-10.5” tester could ride behind someone like himself, he would fit tolerably well, but much beyond that would feel crowded. Two adults will fit in the back seat but three would be hard to swing. Headroom is very good in front but probably meets its match in six-footers who have to ride in back. Doors open wide for uncomplicated entries and exits. The stuff those passengers bring with them is handled in various ways. There’s a decently sized glovebox but the console box is on the small side. A space under the dash holds the USB/auxiliary ports and a 12-volt power point, and has room to hold a digital device or other small item. The console hosts a pair of open cup holders and—in cars with wireless charging—a charging slot and a small tray. Rear storage consists of pouches on the backs of the front seats and cup holders in the pull-down center armrest. All four doors feature small map pockets. The Cruze trunk is usefully roomy, but a high liftover complicates the loading of larger items. The trunk has a wide opening but a high liftover that might make removing heavy or oddly shaped items a bit of a strain. 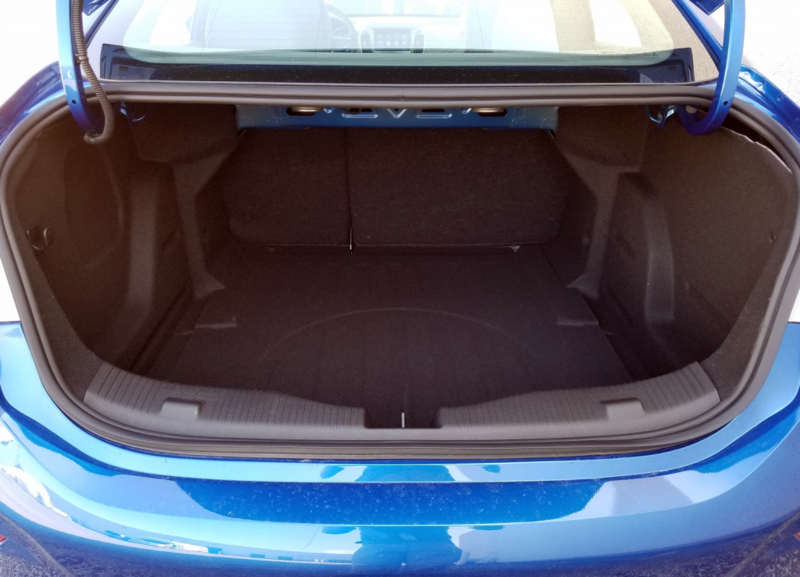 The trunk space is flat on the floor and sides—no wheelhouse intrusions—to create a cargo bay that’s not half bad for a small car. (Note that sickle-shaped trunklid hinges intrude on this space.) Rear seats fold in a 60/40 split for added capacity. While they retract nearly flat, they rest several inches above the level of the trunk floor. At 1.4 liters, the turbo four in the new Cruze’s engine bay sounds like a carryover feature from the older-style car. However, where that engine makes 138 horsepower and 148 lb-ft of torque, the next-gen Cruze powerplant (and the only one currently available for the new car) develops 153 horsepower and 177 lb-ft. This driver sensed a hint of idle roughness, but overall the powerteam in the Cruze provides acceptable power for most driving situations. Cruze’s EPA fuel-economy projections are raised for 2016—for the Premier they are 30 mpg in the city, 40 on the highway, and 34 combined. This reviewer put 190.4 miles on the test car—75 percent of that in city-style operation—and saw 27.6 mpg. Standard is a gas-saving stop/start feature. As these things go, this one is fairly unobtrusive but it can’t be switched off at the driver’s discretion. Steering response won’t scare off any sports sedans but it neither is it fraught with any sloppiness, so maneuverability is good. The worst road bumps make themselves felt in the cabin, but the more run-of-the-mill surface irregularities are smoothed over pretty well. With its extra power, a bit more room, and availability of user-friendly features for the price, the Chevrolet Cruze is a worthy candidate for the attention of compact-sedan shoppers. The new Cruze earns praise for being especially refined and comfortable. 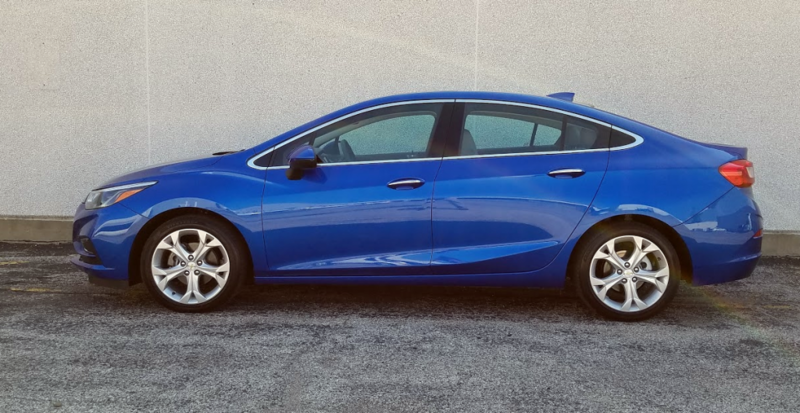 Though not sporty in any way, Cruze rewards drivers and passengers with a smooth ride, quiet cabin, and plenty of interior room. Sadly, we got nowhere near the fuel economy Cruze’s EPA estimates suggest we should have. A shame, as this is otherwise a very compelling compact offering. Kinetic Blue Metallic is a $395 color option on the 2016 Chevrolet Cruze. Written by: The Daily Drive staff on June 30, 2016.on January 25, 2018.